“Calling all stations! Clear the airlanes, clear all airlanes, for the big broadcast!” To the kids living in the Chicago area during the early Eighties, this familiar announcement on WFLD Ch.32 always heralded the welcome weekly arrival of the “Son of Svengoolie,” played by television writer/producer Rich Koz. 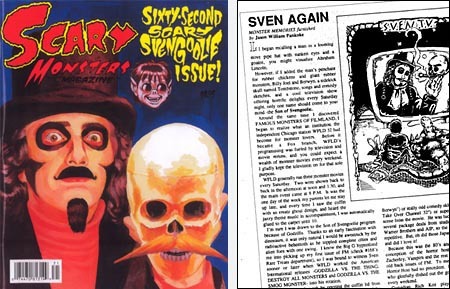 As with Jerry G. Bishop‘s original “Svengoolie” show from the early Seventies, SCREAMING YELLOW THEATER, the Son of… program went beyond the typical methods in which “horror hosts” presented B-movies by filling the time slot with additional skits, songs, and the obligatory bad jokes. Unfortunately, the show would be tossed off the “airlanes” with most of WFLD’s other local programming after NewsCorp purchased Ch.32 in 1985 to use as a flagship station for the FOX Network. After I moved to Champaign in 1993, I tried my hand at freelance writing when I wasn’t working on scripts for ill-fated comic book projects or illustrations for ill-fated RPG systems. I had found early issues of Scary Monsters, a quarterly fan magazine published by collectibles dealer Dennis Druktenis in the Chicago suburb of Highwood, and decided it might be a nice place to start given the more advanced pedigree that would be required to break into larger movie periodicals like Starlog and Cinefantastique. So, I pitched Dennis the idea of doing a Svengoolie “monster memory,” and he gave me a deadline. It wasn’t very long so I drew up a little cartoon to go with it. “Sven Again” would appear in issue no.10 in March 1994 and provide my first byline outside of a school-related publication. I churned out more articles and comics for Scary Monsters through 1997 and then drifted away when other projects grabbed my fancy. Occasionally I’d buy an issue if it had something I really wanted to read, but I otherwise had grown disinterested in the retro-monster culture as a whole. Two weeks ago, I popped into the local Barnes & Noble bookstore to find gifts for Mother’s Day, gliding through the magazine section first like I always do, only to come face-to-face with Sven and his cranial sidekick Tombstone! The culprit behind such front-cover skullduggery was Scary Monsters, of course. It seems Dennis finally gave his loyal Chicago-area readers a “Svengoolie” isssue after years of running articles and cover stories on numerous horror hosts from markets other than the Windy City. Its inevitability stems from the long-ago return of Svengoolie, which I should explain. Less than a year after my little ditty ran, Chicago-based Weigel Broadcasting turned independent Ch.26 into “The U,” marking the changeover with a New Years’ Day marathon of classic television hosted by, among other personalities, Svengoolie! Rich Koz’s alter ego (with the “Son of” no longer in evidence) immediately returned to the airwaves on a weekly basis with all the hallmarks of the original show intact – mostly bad movies, always bad jokes, parody songs, non-sequitur voiceovers, and, of course, loving jabs at the Chicago suburb of Berwyn. (As a kid, hearing Sven single out Berwyn all the time – with the canned punchline being a drawn-out “Berrrrrrrrr-wyn!” – actually made me feel a bit special because, um, that’s where I was born.) Sven is currently in his 13th year on the “U,” and recent licensing has allowed him to finally revisit the Universal Studios classics as he used to back in the WFLD days. Ahhh yeahhhhhh. I thumbed through the new issue right then and there, looking at what Dennis and his current writers had unearthed for the occasion, and would you believe it? It’s “Sven Again” … again! In Dennis’ comments along the bottom of the page spread, he states that this is the first time in Scary Monsters’ 16-year history that he’s reprinted an article, partially done so because issue no.10 is sold out. This comes after 61 prior issues, 15 yearbooks, and other assorted spinoffs. Considering that the average issue in recent years clocks in at more than 100 pages, you can certainly applaud him for the accomplishment. (Scary Monsters’ spiritual predecessor, the original Famous Monsters of Filmland, reprinted articles liberally through the lean times.) So now … I feel old. This entry was posted on Sunday, May 27th, 2007 at 2:49 pm	and is filed under JP Confidential, The Old School. You can follow any responses to this entry through the RSS 2.0 feed. Both comments and pings are currently closed. 14 distant relations of Jan Tschichold dissected this page in 0.365 seconds while exacting sweet revenge in silence.